CHARLOTTE, N.C. (CNS) — Participants in the 14th Eucharistic Congress of the Diocese of Charlotte prayed for reparation and healing in response to new revelations of clergy sexual abuse, sexual misconduct and abuse of power by some church leaders. Many afterward agreed the Sept. 7-8 congress was “a beautiful Catholic answer” to the tumult experienced by the U.S. church in recent weeks. Three times during the congress, Bishop Jugis addressed the abuse crisis that has provoked an outcry among Catholics in the U.S. since allegations arose of sexual misconduct by church leaders and the release of a Pennsylvania grand jury report detailing decades of child sexual abuse by hundreds of priests. “Throughout the congress, we want to offer prayers of reparation, because as we all know from the horrible revelations from last month, that the horrible sins of abuse and misconduct and the sins of abuse of power and position have reared their ugly heads in the church, and for this we are saddened and outraged,” Bishop Jugis said in opening remarks Sept. 7. He expanded on his message during his homily at the closing Mass the next day. The congress, he said, was a time for the people to come together “with one united voice” to pray for healing in the church, even as Catholics have reacted with “shame, anger, disappointment, disgust and feelings of betrayal” to the allegations of abuse and cover-up. “I share your sorrow and I am truly sorry for these crimes that have been perpetrated against the innocent,” he said. “We need to pray for healing in the church,” he added, for abuse victims, for the perpetrators and for the entire church. Such steps are necessary “to begin to repair and restore trust” in church leaders, Bishop Jugis said. Meanwhile, Catholics must work to pursue “radical holiness in our own lives,” the bishop said. “In this Eucharistic Congress, the whole family of the Diocese of Charlotte and lay faithful … have come together, and with one united voice beseech the most Holy Trinity to have mercy on the church and grant the grace of cleansing and purification and renewal,” he said. During the holy hour, thousands of people knelt on the concrete floor of the convention center, joining in prayer before the Eucharist exposed on the altar. 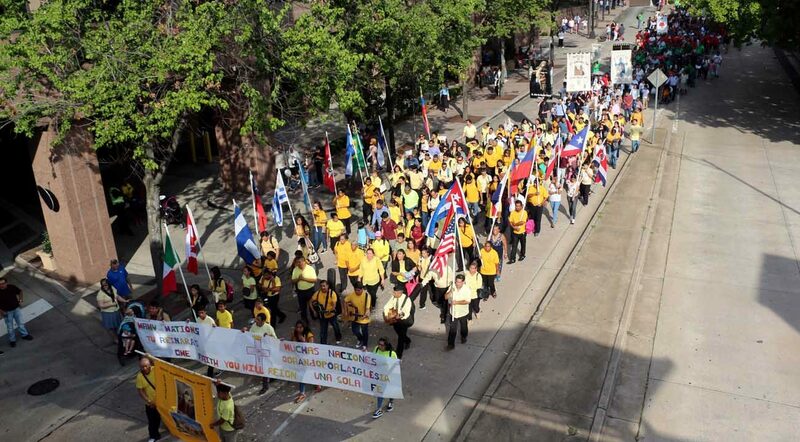 Responses were enthusiastic, not just from people attending the congress but from Catholics around the world who watched a live broadcast of the mile-long eucharistic procession through the streets of Charlotte Sept. 8 on Facebook. The procession “was our beautiful Catholic answer to the evil Judases in the church!” wrote Stacy Peterson. People from as far away as Peru, the Philippines, India, the United Arab Emirates and Nigeria watched, according to diocesan data collected on viewers. “I pray for more of this,” wrote Julia Spagnuolo from Ontario, Canada. “This is so good,” said Passy Agenonga from Kampala, Uganda. “We need more of this,” agreed Patty Harrington from Binghamton, New York. Eucharist needs to be made the center of our lives.